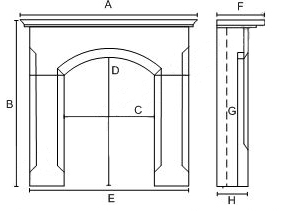 The Brompton Agean limestone fire surround is one of the most popular of the Agean limestone fire surrounds. The price quoted is for the limestone fire surround only. is the limestone matt or gloss? Same question for the hearth - I prefer the matt look and not gloss so this is key to my decision. Thanks. The Brompton Agean limestone fireplace has a matt finish. If you order the matching limestone back panel and hearth they will be a matt finish too. If you order one of the Brompton packages, they mostly have a contrasting black granite hearth which is glossy.